Many thanks to the thousands of Apple faithful who have been sending me greetings on this, the holiest day in our Apple calendar, the Apple equivalent of Christmas — yes, it’s my birthday. Fifty-three years ago today a savior came into this world, born not in a manger but in a Bay Area hospital, which to be honest in 1955 was pretty much the same thing. San Francisco wasn’t always the nicest place in the world. That happened later, when the gays started moving in. Of course I’ve heard of “War and Peace.” I’ve even read substantial parts of it. The rest I had read for me by one of my assistants at Pixar who worked up a treatment for me and then recorded himself reading the treatment so I could listen to it on my iPod. Anyway. The thing is, I really am an intellectual. Have you seen the way I dress? And I really resent this anti-intellectual treatment I’m getting. So here’s what I’m going to do. I’m going to start reading all the big brainiac books that I’ve never read, and then I’ll be making sure I drop references to them into every conversation I have. 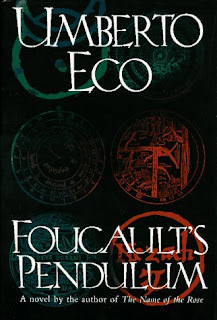 And I’m starting with the one book that I’m convinced no one has ever actually read even though every big brain poser owns a copy — “Foucault’s Pendulum” by Umberto Eco. It’s super huge, like 600 and something pages, and really intense, and extremely hard to understand. I’ve picked out a rare signed first-edition hardcover because that’s all I ever read. It just feels more authentic to me to read a book that costs a few thousand dollars rather than some random paperback that anyone could just buy in a store. As soon as I’m done with the Eco book I’m going to start mentioning it all the time and then saying, “It’s this really amazing book — have you read it? You really should.” After that I’m on to the complete works of Harry Mulisch, starting with “The Discovery of Heaven.” And I’ll mention that all the time too. After that, Lacan and Derrida. Trust me, I’m going to be friggin unbearable. Happy birthday to me. Now I must go up to my Jobs Pod and get to work. I’ve got a big day of reading ahead of me. Peace out.